Capital One Spark business cards are very popular in among business owners. If you have not already heard of them, they are widely known for great cash back savings on all types of purchases. Many business owners use them to get cash back on their annual expenses by putting everything on their Capital One business credit card. To learn more, we have put together the top Spark business cards here to help you lessen the cost of living with all the rewards dollars you earn. The Capital One Spark Cash for business is meant for business owners who have a good-excellent credit score. Upon sign up, the card offers a first year $0 annual fee and then $59 after that. Although there is no bonus 0% APR intro financing, it does have a one time bonus of $500 after spending $4,500 on purchases within your first 3 months. Needless to say, that $500 is a nice savings if you know you are spending more than $1500 on the card per month anyways. And, above all, it offers 2.00% cash back on all purchases. This card is a step down from the Spark Cash card. It offers 1.5% cash back with the option to earn $200 cash bonus after spending only $3,000 in the first 3 months. However, this card makes a great fit for business owners who could use a 0% interest rate for an introductory period. This money can be used for additional equipment, inventory, demographics marketing or whatever your company needs. With a nice introductory offer, you can get that boost of liquidity your business needs. Featured on many credit card websites, this is the ideal business credit card for owners who have less than perfect credit. This is Capital One’s business card offering for average credit. While it’s ratings are just above 3.5 stars out of 5, this card can get you a $10,000 credit limit without too much hassle. When other cards might decline your application, this would be an alternative option that still offers 1.5% cash back. If you are a rewards expert, then you might be more interested in the miles business cards from Capital One. 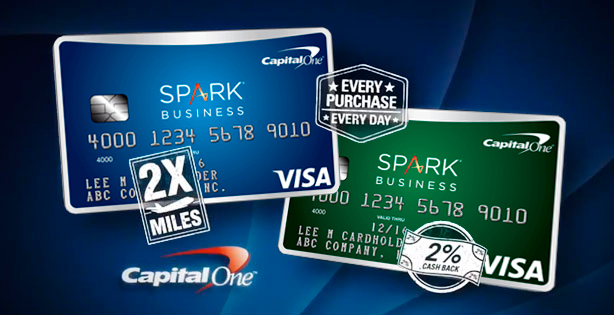 This card, the Capital One Spark Miles for Business card, is another premium rewards card for business. It is recommended for business owners with a credit score of 700 or more who can meet the 30 days payment terms. When approved, the owners receive 50,000 miles after spending $4,500 in the first 3 months. Compared to the Cash for Business card, you still have to spend the same amount, but you might be able to make those 50,000 miles go much further than the $500 cash bonus. For business owners who understand rewards, this could be a savvy choice. Once again, Capital One offers a step down option from its premier rewards card. The Miles Select offers an introductory 0% interest period for 9 months. Similar to the Cash Back Select card, this is a great option for business owners who can use 9 months of free interest. But then, they can make the most of the miles rather than the cash. The unique point to this card is that there is no annual fee, compared to the $59 fee of the Spark Miles for Business card. While most business credit cards provide a year-end summary for all account holders, most do not provide quarterly reports too. However, Capital One Business credit cards do. With any of the aforementioned business cards, you get access to custom itemized reports of business spending. This helps simplify budgeting and filing taxes at year’s end. Use any of the top Capital One Spark business cards mentioned above to gain these financial reporting benefits. These 5 Capital One Spark Business cards are all great options for business owners. Depending on your current business needs, you are sure to find one that works for you. Of course, if you are in a better situation with a higher credit score, it can be worthwhile to go for the premium cards. If not, now might be the time to go after 0% interest offers until business is in full swing again.